PezCycling News - What's Cool In Road Cycling : EUROTRASH News Round Up Monday! EUROTRASH News Round Up Monday! Reports and results from the Vuelta a Valencia and the Etoile de Bessèges, plus cyclocross from Lille and Hoogstraten, all with video. Glasgow in Scotland gets the first 'Super World Championships' in 2023 - Top Story. In other cycling news: Philippe Gilbert starts his 2019 season, Florian Stork steps up to the Sunweb WorldTour team, Deutschland Tour and the Tour of Oman 2019 and more women in the Union Européenne de Cyclisme. A full EuroTrash Monday. 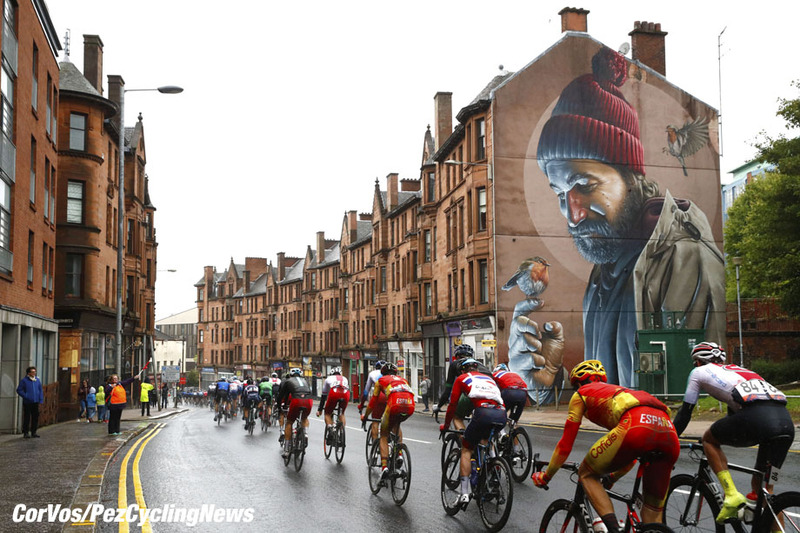 The first 'Super-World Cycling Championship' in 2023 will be held in Glasgow. The UCI announced the allocation on Friday. 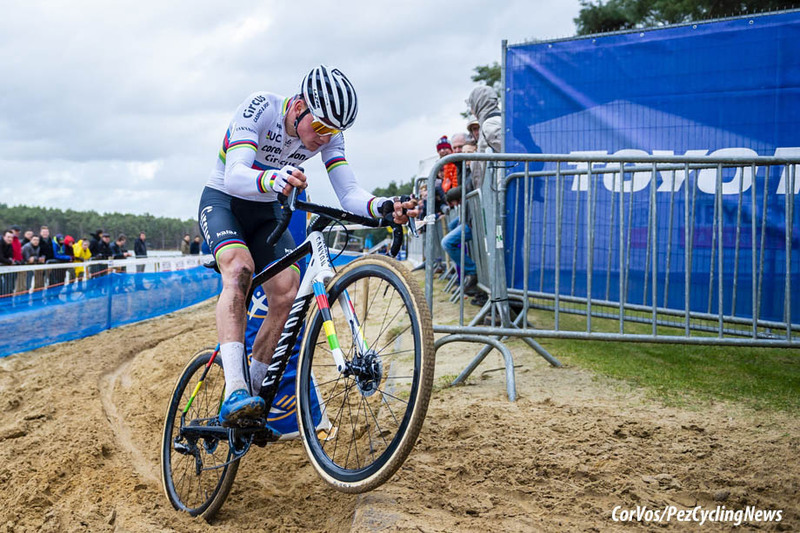 No less than thirteen cycling disciplines, including road cycling, mountain biking and track cycling, are part of this 'Super-World Championship', which will be held in August 2023 and will last two weeks. 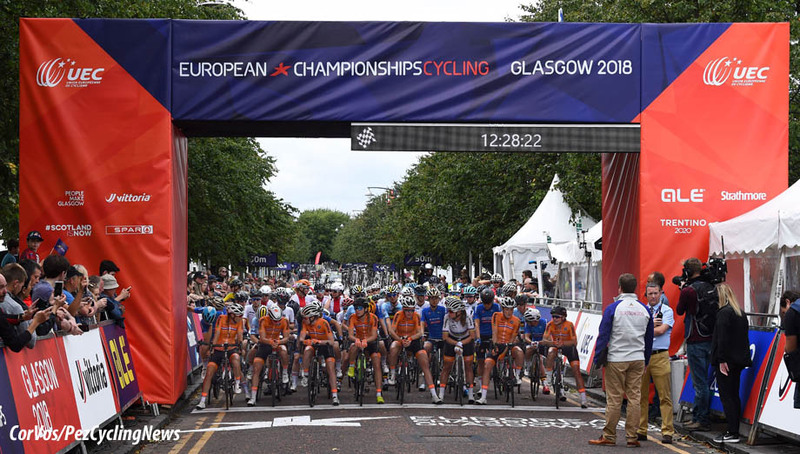 Glasgow and Scotland have a lot of experience with the organization of major cycling events, such as World Cup Mountain Bike and track cycling. Last year, the European cycling championships, track cycling, mountain bike and BMX were held in Glasgow. With existing facilities such as the Sir Chris Hoy Velodrome and the Glasgow BMX Center, Glasgow can accommodate this event without having to build new locations. "I am very proud that today the UCI awarded the World Cup of 2023 to Glasgow", said UCI President David Lappartient. "The creation and implementation of this event was one of the commitments I made in my campaign for the UCI Presidency. I am proud that I have now fulfilled that." Last June, the UCI announced that a 'Super World Championship' will be held every 20 years from 2023 onwards. In addition, the World Championships road cycling, mountain bike, track cycling, BMX, Urban Cycling, Para-Cycling, artificial bikes, bicycle ball and Gran Fondo are awarded to the same region, creating a major event lasting several weeks. The UCI predicts that this 'Super-World Championship' will become a unique platform, where there is a lot of exposure for the various cycling disciplines. Fans also have the opportunity to visit several World Championships in the same region. It ensures that the costs fall and that they can discover new disciplines. Matteo Trentin (Mitchelton-Scott) won Stage 2 of the Tour of Valencia. The European champion sprinted into Alicante ahead of Frenchman Nacer Bouhanni (Cofidis) and Brit Ben Swift (Sky). Edvald Boasson Hagen (Dimension Data) held the leader's jersey. Nevertheless, the sprinters had a chance, since after the Alto de Carrasqueta (7.8 km at 3.4%) it was still more than forty kilometers to the finish. Six riders tried to reach the final first. Who? Raul Alarcon, Mathias Van Gompel, Mikel Iturria, Diego Rubio, Nigel Ellsay and Ibai Azurmendi. Matteo Trentin came through from a messy sprint without any team in control. Bouhanni was stuck to the Euro champs wheel, but could not come past. Stage winner, Matteo Trentin (Mitchelton-Scott): "It feels really good, especially because I was working really hard during the whole winter and actually seeing the whole team so committed on this first road stage, the first race for us in Europe, it gave me that extra motivation for sure. I was feeling good, my numbers in training have been all right but numbers and racing are two different things. Today I was never struggling, I was surfing in the wheels and in the final I think I pulled up a really good sprint coming at the right moment, in the right position, so I am really happy. We knew that the second position was the maximum position to come out of the roundabout to win the stage. When you leave the roundabout so close to the finish, for sure if you are in fourth position then the guys in front start sprinting and you are still cornering. I preferred to just give it a go as the first guy and I came really fast, so it was a good move." 3rd on the stage, Ben Swift (Sky): "The guys were incredible. It's what I've really missed - that real team unity. When we decided to go we took it on. We waited ever so slightly too long just as we started the final push on the lead-out. They came three or four kph faster than us so it was just about trying to catch up. And with that roundabout being a little bit precarious where you entered that was where you came out really. It was a really good job from the guys and the legs are feeling good. With Chris (Lawless) being a second year pro it's really good experience for him to do a lead-out. He's going to be the sprinter for this team in the next couple of years. So for him to learn what he needs and what he wants of a lead-out rider is good. It's nice to get a good result. It shows I've been training pretty well and I handled the climbs really well. But in hindsight I wish I'd gone a little bit earlier, if I'd have started my sprint with the idea of finishing at the roundabout." 4th on the stage, Sonny Colbrelli (Bahrain-Merida): "First sprint of the season, not so bad. I was in a good position with Matej Mohorič and Jan Tratnik, we just got the final roundabout wrong. But all in all it’s a good result and there are further opportunities to come." 10. Christopher Lawless (GB) Sky. 10. Diego Rosa (Ita) Sky at 0:20. A punchy finale to Volta a la Comunitat Valenciana Stage 3 gave Greg Van Avermaet the perfect opportunity to show his strong early-season form with the CCC Team leader powering to victory after an impressive display of teamwork in the final kilometers of the day. It took around 20 kilometers for the day’s ten-rider breakaway to form and with a relaxed peloton behind them, their advantage was sitting at seven minutes as they crossed the finish line after climbing the Sot de Chera and the Salto de la Mora for the first time. Over the next two categorized climbs, and the undulating roads in between, the gap started to fall with race leader, Edvald Boasson Hagen’s Team Dimension Data teammates and Astana Pro Team setting the tempo at the front of the main bunch. With 30 kilometers to go, and the peloton still pushing hard behind them, the breakaway’s advantage had fallen to inside three minutes and it looked certain that the race would come back together before the start of the second ascent of the Sot de Chera. At the same time, CCC Team signaled its intention by moving up to the front of the bunch to protect Van Avermaet and help guide him into position ahead of what was to be an exciting and explosive finale. It was Alessandro De Marchi and Łukasz Wisniowski at the front of the reduced field as the final rider from the breakaway was reeled in with seven kilometers to go before more strong teamwork saw CCC Team chasing down a flurry of late attacks to defend the interests of Van Avermaet. Guillaume Van Keirsbulck led Van Avermaet onto the base of the final climb, setting a pace that put pressure on the rest of the field and allowed Van Avermaet to maintain his position at the front of the bunch as the road began to weave up into Chera. 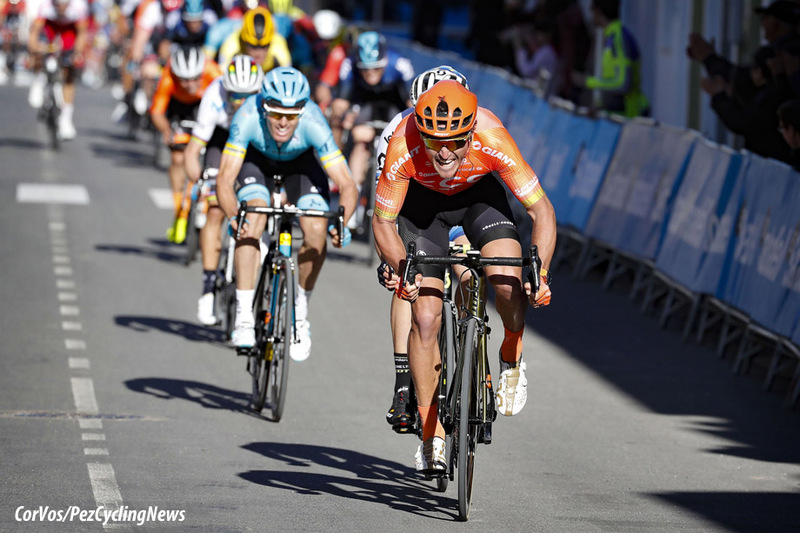 In the end, Van Avermaet proved that he was the strongest at the end of 194.3-kilometer long stage, powering around the final corner and up the drag to the line to seal victory number one of 2019. Congratulations, Greg. How do you feel after your first win of 2019? "I am really happy to take this win and it’s actually my first individual win here after winning the team time trial in 2017 and 2018. It’s always great to start the season with a win and especially on a hard parcours like this with everyone on the limit. I felt really strong today though and the team did a really good job all day but especially on the final climbs. In the end, I was in a good position on the last switchback, I was positioned perfectly, so I started my sprint hoping that nobody would come around me. It’s really good to start the season like this." You were named as one of the favorites coming into today. Were you confident in your form ahead of the stage? "You train during the off-season and you hope to have good legs directly after a training camp but you never know. I think my form was there today and all the effort in the months leading up to this paid off. That’s always a nice feeling to have. I felt good but I was keeping an eye on Valverde as he is one of the strongest on an uphill finish like this plus there were also some good sprinters still there. I think the fact that I’m a little bit of better climber than them played on my side. There were some attacks at the end, but the team rode really well and it was nice to see four of my teammates up there with me in the final. I just had to finish it off." You’ve mentioned the strong teamwork in the final kilometers of the race. How important was that today? "It was really important on a day like this. We worked really well together at the start and we all survived the second to last climb. Then, I asked Guillaume to put me into a good position at the bottom of the final one. He did a perfect job and was even able to go a few kilometers further into the climb for me. I was quite surprised that we still had four guys from our team there. De Marchi did a really good job to set a hard pace and Wisniowski and Antunes were still there too and that was really important. A lot of us here are still new to one another but it was great to see the guys working for me as well as they did today. It was all about position in the final corners and the guys made sure I was in the right place. To deliver a win with these guys is special as it’s not easy especially with the field we have here." 10. Marco Canola (Ita) Nippo-Vini Fantini-Faizane. 10. Jesus Herrada (Spa) Cofidis at 0:24. 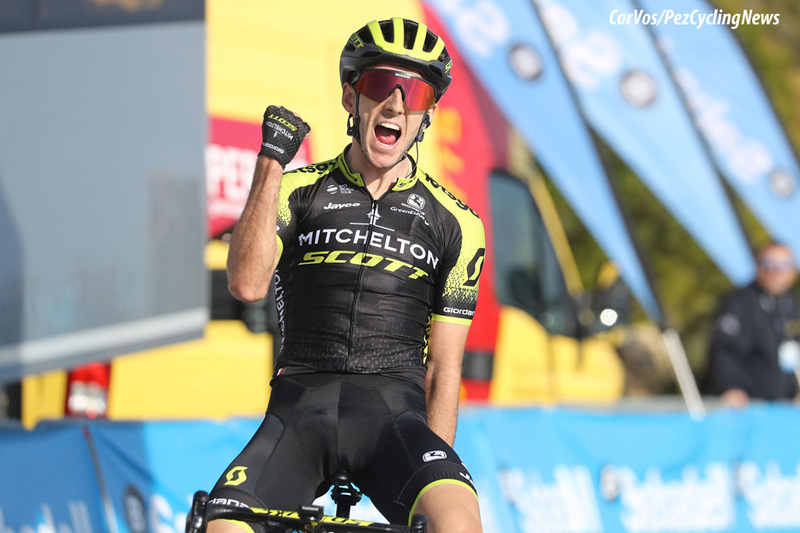 Adam Yates (Mitchelton-Scott) won Stage 4, holding off Alejandro Valverde (Movistar) at the line. Ion Izagirre (Movistar) finished 4th and took over the leader's jersey from Edvald Boasson Hagen (Dimension Data). Silvan Dillier, João Rodrigues and Diego Rubio had a maximum 5 minute lead, but it wasn't enough. Dillier was the stronger of his companions, and eventually the AG2R-La Mondiale Swiss rider was on his own with a 4 minute lead with 20 kilometers to go. On the final climb; Dillier only had a 50 second lead, which was not enough for the stage victory. Merhawi Kudus made an attack 3K out, he stayed away for a while, but when things got hot at the front he was caught and dropped. The race leader, Edvald Boasson Hagen, was also in trouble and lost his jersey. A group of the favorites with Yates and Valverde would fight for the stage victory and the leader's jersey in the last kilometer. Jésus Herrada tried with no success. Yates succeed in his escape and nobody could follow the Brit and he rode to the finish for the win. Behind him, Valverde, Bilbao and Izagirre chased, but were too late. The World champion had to be content with second place, as Izagirre took over the leader's jersey from Boasson Hagen. Stage winner and 8th overall, Adam Yates (Mitchelton-Scott): "We wanted it all to come together for the finish and for the break not to stay away. Dimension-Data actually did a pretty good job of controlling the break and it was only in the final we had to put some guys at front to close the gap. The run in was always tricky, I’ve done it before at the Vuelta a España so I knew how tricky it was. I knew how steep the climb was and I just had to pace my effort and that’s what I did. It feels good, I’ve had a really good off-season, I’ve been really consistent with my training and doing everything correct and it just goes to show when you commit like that everything comes together so it is a really good feeling." Overall leader and 4th on the stage, Ion Izagirre (Astana): "Today, we changed our tactic; we preferred to stay a bit inside the group and to save some energy since we knew that the last climb will be the decisive one. The team was very strong today and I always had a good support from my teammates during the day. On the last climb everyone just gave his all, maybe we missed something to win the stage, but, well, we came here for the general classification and I am happy to become the leader after this stage. Also, Pello Bilbao was very strong and it is great he is third now in the overall. We still have one stage in this race. Normally, it has to be a stage for sprinters, but, anyway, we will keep our concentration on maximum until the finish of tomorrow’s stage." 3rd on the stage and 3rd overall, Pello Bilbao (Astana): "I am really happy with the stage we have done today, with the team’s work and with the feeling that I had. It is a very nice start of the season, which gives me a lot of confidence that all the work has been done during the winter was in the right direction. As a team we worked very well all the week here, maybe just today we had more conservative tactic. In the end of the day we reached a good result at the stage, taking the lead in the overall classification. This race was not our main objective, but, anyway, we wanted to come here in a good shape to try to fight for a high result. Together with Ion Izagirre we kept under control the situation on the final climb. We knew, we had some advantage in the general classification and just had to distance Boasson Hagen to take the lead. In the end we did our best to control the other rivals and it worked pretty well. Tomorrow we have to be very attentive and not to do any mistakes to finish both on the podium." 10. Rui Costa (Por) UAE Team Emirates at 0:48. Dylan Groenewegen (Jumbo-Visma) won the Final Stage 5 of the Tour of Valencia in the region's capital city of Valencia on Sunday. The Dutch rider won the mass sprint after 88 kilometers Paterna onto the local laps of Valencia. He out-sprinted Alexander Kristoff (UAE Team Emirates) and Matteo Trentin (Mitchelton-Scott). Ion Izagirre (Astana) successfully defended his leader's jersey for the final overall win. Four riders escaped from the start: Aaron Van Poucke (Sport Flanders-Baloise), Alexey Kurbatov (Gazprom-RusVelo) and Gotzon Martin (Euskadi). The three quickly had a 2 minute lead. Alexis Gougeard (AG2R-La Mondiale) counter-attacked and managed to cross to the leaders. The peloton didn't let the four get too far away and as the leading group approached the city centre circuit in Valencia after an hour, the gap was only 35 seconds. In Valencia; the Jumbo-Visma team took the lead for their sprinter Dylan Groenewegen and with 13 kilometers to go, the race was all together. 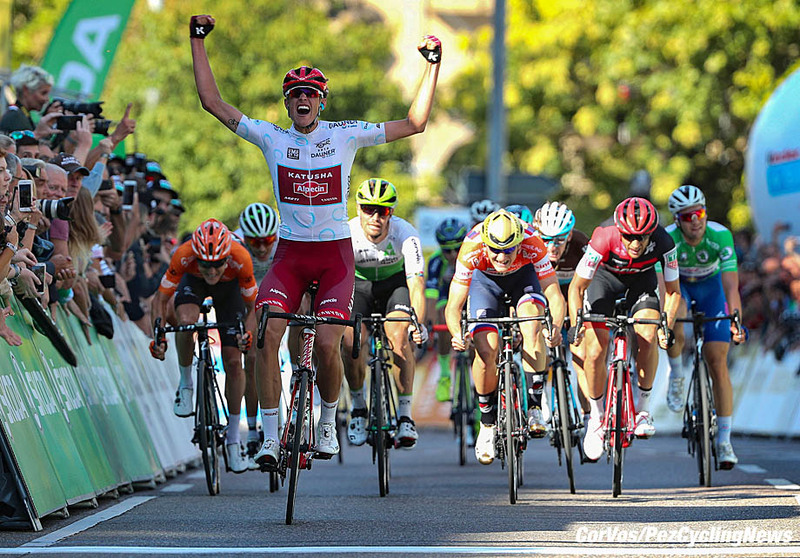 The Jumbo-Visma train kept the pace high and a new attack from Julien Duval (AG2R-La Mondiale) was quickly ended and a bunch sprint was guaranteed. A crash in the finalé took some riders out. Luka Mezgec led-out the sprint for Trentin, but Groenewegen got up to the European champion and pushed his wheel across the line first. Alexander Kristoff also out lunged Trentin for 2nd place. Groenwegen gave the Jumbo-Visma team their first win of 2019. Astana's Ion Izagirre finished safely to take the final overall victory. Stage winner, Dylan Groenewegen (Jumbo-Visma): "This is a victory for the entire team. It was a tough final with many corners and the pace was very high. In the last corner I had to come from too far back, but by jumping from wheel to wheel, I managed to claim the victory. The team did a great job the entire day by controlling the race and I’m glad I finished it off. For me, this victory is very important. It gives confidence to the races that are yet to come. Today was a moment to do so. Not only is it my first win of the season, but also the first for the team under the new name. I am very happy." Final overall winner, Ion Izagirre (Astana): "I am super happy with this victory, but I have to say that this is team’s success, not only mine. We rode this race very well as a team and in every moment I had a great support from my teammates. We’ve got almost maximum in this race with my victory, a third place of Pello Bilbao and a win in team classification. Fantastic! I started this season with a goal to win at least one race and already here in Valencia I’ve got it. It is something special for me to win in Astana jersey, I am proud of it!" 2nd overall, Alejandro Valverde (Movistar): "We won last year and we're not leaving empty-handed this year, either: finishing in 2nd place, with such a luxury podium, is a good result. It's been a beautiful race, a very tight one, with a great winner in Ion. He's a good friend of mine, a team-mate for many years in the Movistar Team as well as a huge source of help in last year's Innsbruck Worlds. I also remember he crashed at the very same turn I got badly injured in Düsseldorf during the opening time trial of the 2017 Tour de France. It's a good sign to be here, both of us, recovered and offering Spanish cycling some more joy. In the end, crashes are part of our sport, the element of risk we have to face every day. All in all, I think we gave it a good fight, both in the crucial stages and the overall result - but yesterday's climb, so explosive, wasn't the place for me to bridge the gap overall back to Ion, so I knew it was sort of an impossible task to bounce back after the TT. Yates was a well-deserved winner, so I feel happy with the 2nd place in Alcossebre as well as in the GC." 3rd overall, Pello Bilbao (Astana): "I think, this is the best way to start the new season. I am happy with my result and, of course, I am happy for Ion Izagirre and his victory. My result in this race proves that I worked really well during the off-season. With the team we had two very productive training camps in December and January, where a huge amount of work has been done together with our trainers and bike engineers. Now, at the Volta Valenciana we see how all this work pays off. After this strong start of the season I am looking forward to continue improving in the next races." 2nd on the stage, Alexander Kristoff (UAE Team Emirates): "At 400 meters to go, I found myself a head and maybe it was a little bit too early. Then the riders from Mitchelton Scott team came up from behind before the final curve and I lost the wheel of Matteo Trentin. At 200 meters to go, I started my sprint but when I was within reach of the victory up came Dylan Groenewegen. He is definitely one of the fastest sprinters in the world at the moment. But I’m proud of the team’s work and especially the show by Mercato who pulled in the last five kilometers and helped very much to keep the group of strung out without causing me to lose too much energy." 4th overall, Dan Martin (UAE Team Emirates): "I’m happy with the work that I’ve done here with my teammates. I didn’t have the training in my legs necessary to fight for the win on the climbs like yesterday but the teamwork is encouraging with the next appointments coming up. Now I hope to do well also in the UAE Tour." 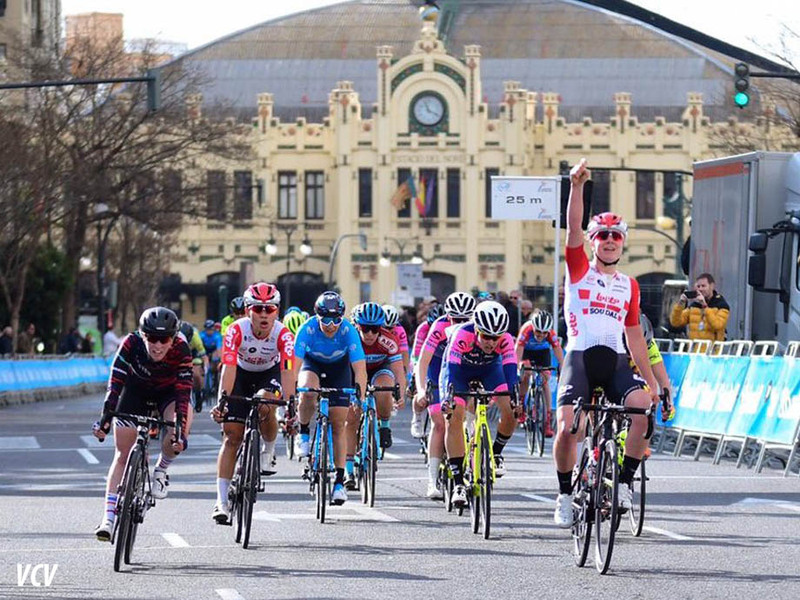 23 year-old Belgian cyclist Lotte Kopecky of Lotto Soudal was the winner of the 2019 Vuelta a la Comunitat Valenciana Féminas, the first edition had the participation of 111 riders from 19 teams. The route of the Vuelta CV Féminas was the same route as the last stage of the VCV Gran Premi Banc Sabadell men's race; 88 kilometers departing from Paterna and finishing in the Plaza del Ayuntamiento de Valencia. Also, the Vuelta Féminas CV stands out as the race that also promotes equality with the prize list. The winner of the Vuelta CV Féminas received a 2,435 euro prize, the same amount given in the men's event. 10. Rachele Barbieri (Ita) BePink. Stage 1 of the Etoile de Bessèges was won by Bryan Coquard (Vital Concept-B & B Hotels) on the streets of Beaucaire. Sacha Modolo (EF Education First) was second ahead of Pierre Barbier (Natura4Ever-Roubaix-Lille Metropole). Edward Planckaert, Nicolas Baldo, Juan Antonio Lopez, Marco Bernardinetti and Jan-André Freuler escaped early in the stage. 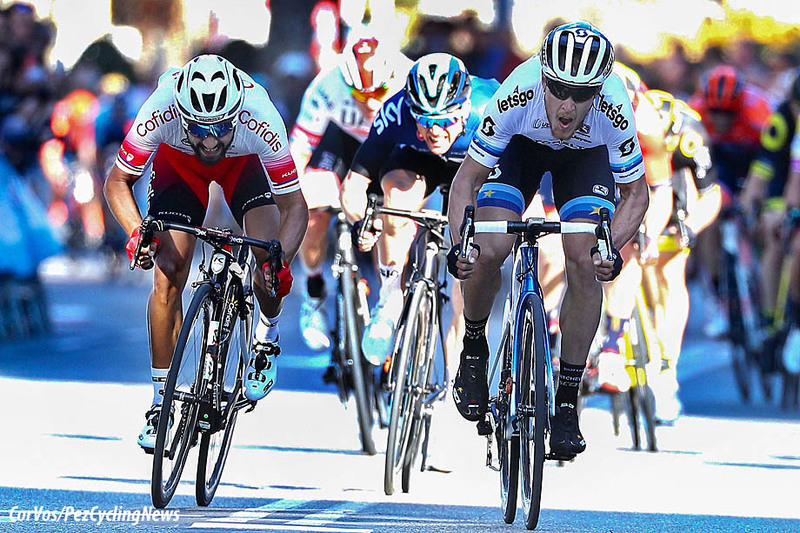 The maximum lead was up to 6 minutes, but the break never had a real chance of stage victory. With ten kilometers to go; the leaders were caught and the peloton prepared for a mass sprint. Jérôme Cousin tried to surprise the sprinters with a last minute attack, that did not work. Coquard was the fastest sprinter. The 26-year-old Frenchman defeated Modolo and Barbier the third victory this season for the Vital Concept-B & B Hotels team. Stage winner and overall leader, Bryan Coquard (Vital Concept-B & B Hotels): "I am happy with my condition. It was really a cat-and-mouse game between the sprinters team today. As usual at the beginning of the season. The team managed to put me off well in the final. We know that we have to start the season well, we are here to win races, but also to have fun. I also feel less pressure by attracting Pierre Rolland and Arthur Vichot." 10. Amaury Capiot (Bel) Sport Vlaanderen-Baloise. 10. Kenny Dehaes (Bel) Wallonie Bruxelles. Cofidis' Christophe Laporte won the Stage 2 in La Calmette. The Frenchman was the fastest in the sprint, with Clément Venturini (AG2R-La Mondiale) finishing in 2nd place, Enzo Wouters (Lotto Soudal) was 3rd. Laporte also became the new overall leader. Saint-Geniés-de-Malgoires, about twenty kilometers northwest of Nîmes, was the starting point of the second stage of the Etoile de Bessèges. Five riders managed to get away after half an hour of fast racing: Pierre-Luc Périchon, Jérôme Cousin, Amaury Capiot, Romain Combaud and Emiel Vermeulen. The leading group had around 3 minutes, but at the start of the last sixty kilometers the peloton slowly increased the pace. When the lead was to only one minute, Cousin jumped away and was joined by Capiot. 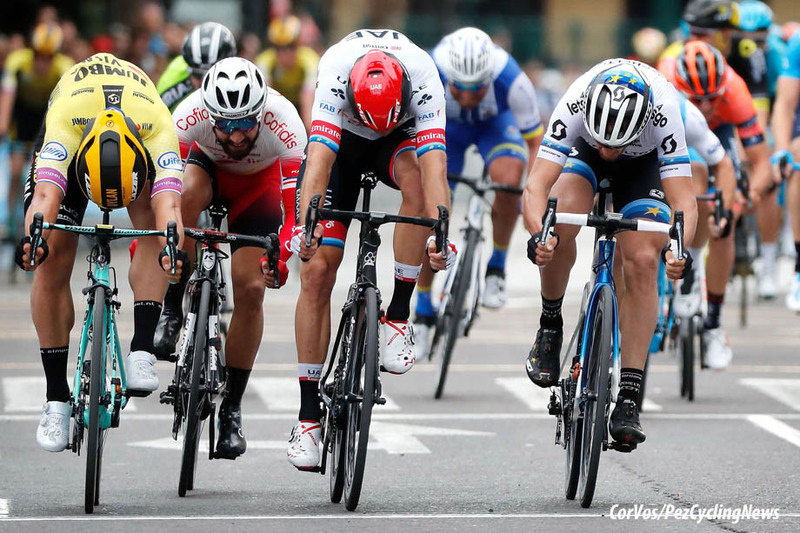 The sprinters teams saw the danger and they were caught 16 kilometers from the line. The sprinter's trains led the peloton into the last kilometer, where Christophe Laporte got the better of Clément Venturini and the Belgian Enzo Wouters. Laporte also took the leader's jersey from Bryan Coquard, who only finished 19th. 2nd on the stage, Clément Venturini (AG2R-La Mondiale): "Even if I was not far off the win, I am staying very positive about this stage. It is only my second day of racing for the season, and I am close to the victory. It’s better than nothing and always good to try. Today, I probably started from too far out, but Laporte was also just very strong. I am in a good situation, and I hope that things will continue like this. Tomorrow the stage looks a bit harder and it suits me well. It should end in a sprint, so we should try again as we did today." 10. Marc Sarreau (Fra) Groupama-FDJ. 10. Pierre Luc Perichon (Fra) Cofidis. Marc Sarreau (Groupama-FDJ) won the Queen Stage 3 on Saturday. The Groupama-FDJ rider was fastest after a chaotic day full of attacks in Bessèges. Christophe Laporte held onto the overall leader's jersey. The peloton split into two parts in the early part of the stage due to the high pace. Sacha Modolo, Pierre Barbier and Enzo Wouters, all in the top 10, missed the move and the back group never saw the front again. With 50 kilometers to go, the gap was more than 5 minutes. There were may attacks in the front group: Pierre Rolland and Ben Gastauer tried, but couldn't stay away. Axel Domont, Anthony Turgis, Alo Jakin, Evaldas Siskevicius, Quientin Pacher and Eliot Lietaer also tried their hand, but with 3.5 kilometers to go they were caught. In the sprint, overall leader, Laporte saw the danger Sarreau, Mikel Arisi, Niccolo Bonifazio, Bryan Coquard and Clément Venturini and managed to fend them all off, except Sarreau, to keep hold of the leaders jersey. Stage winner and 3rd overall, Marc Sarreau (Groupama-FDJ): "I am very happy that I am here today to win the victory, because if I had not won in the Etoile, I would be very disappointed. Today was the first day that I really had an opening. The past two days I was always too far from behind. Now I had a happy job in my sprint. Nice that it succeeded even though I started sprinting too soon. I put a lot of pressure on myself to win quickly. I want to win races and I know that the team also expects me. If I had not won today, it would have been a long time in my head until the next game. Now I have confidence." 10. August Jensen (Nor) Israel Cycling Academy. 10. Yoann Paillot (Fra) St Michel-Auber 93. Christophe Laporte (Cofidis) won the Final Stage 4 and the final overall classification of the Etoile de Bessèges. The 26-year-old Frenchman set the fastest time in Ales in the 10.7 kilometer time trial. Belgian Jimmy Janssens (Corendon-Circus) posted the early fast time in southern France with 15:52. Bauke Mollema (Trek-Segafredo) just matched his time, but it was Tobias Ludvigsson (Groupama-FDJ) managed to finish 13 seconds faster. The Swede looked like he might win the French stage race, like in 2014, but Laporte was still to cross the finish line. Laporte finished 48 hundredths of a second faster than Ludvigsson, which gave the Frenchman the final win. Laporte succeeds his compatriot Tony Gallopin on the honors list. 10. Eliot Lietaer (Bel) Wallonie Bruxelles at 0:32. 10. Eliot Lietaer (Bel) Wallonie Bruxelles at 0:48. World cross champion, Mathieu van der Poel (Corendon-Circus) won the Krawatencross in Lille on Saturday. The new champion waited less than a lap to drop everyone in the race to solo to the finish. Michael Vanthourenhout (Marlux-Bingoal) and Toon Aerts (Telenet Fidea Lions) joined him on the podium. Quinten Hermans (Telenet Fidea Lions) was the fastest starter, but when the World champion, Mathieu van der Poel, put pressure on the pedals no one had an answer to his speed. Joris Nieuwenhuis (Sunweb) tried to hold on to Van der Poel but he was at 5 seconds at the start of the second lap, with the rest at more than 10 seconds. Van der Poel's lead grew visibly, and he soon had more than half a minute. After Hermans and Nieuwenhuis effort, Michael Vanthourenhout tried his hand at the chase, but as usual had no chance. After the half-way point; Van der Poel crashed on a bend and lost half his lead, but there was no panic. On the lap Vanthourenhout fought for the podium with Belgian champion Toon Aerts as Van der Poel rode on to yet another victory. Race winner, Mathieu van der Poel (Corendon-Circus): "I placed that early attack because I knew I could win the intermediate sprint classification. That was the goal today. My handlebars were a little crooked, but for the rest it was not bad. I was not focused enough for a moment. I started to slide and I continued to slide. So I was suddenly lying on the ground. Sometimes mistakes creep in when you ride comfortably in front. I was also in my head a bit with tomorrow." 3rd, Toon Aerts (Telenet Fidea Lions): "You had to race with snorts today to keep your position. That made it difficult, the best is finished. I immediately saw that Mathieu was full for the intermediate sprint. Then you know that it will be difficult to get him back before that intermediate sprint. I have not wasted much more on that. All in all, I am still satisfied with this third place. Hoogstraten should be better for me. I went to look at this week and it's going to be a greasy cross with a lot of wind, I'm looking forward to it." 10. Jim Aernouts (Bel) Telenet Fidea Lions at 0:35. Mathieu van der Poel (Corendon-Circus) won the penultimate round of the Superprestige in Hoogstraten on Sunday. The World champion had opposition from Toon Aerts (Telenet Fidea Lions) until 20 minutes to the finish, but in the end it was the World champion who easily bet the Belgian champion and everyone else. This was Van der Poel's seventh victory in seven rounds of the Superprestige and his thirtieth in total for the season. Just like Saturday in Lille, the opening lap went to the fast starter Quinten Hermans. World Champion Mathieu van der Poel was right with him, but he had indicated in advance that he would postpone his attack today longer than yesterday in Lille. In this way slower starters, like Toon Aerts and Eli Iserbyt got back to the front after a lap. Toon Aerts didn't wait and as soon as he made it to the front, he put on the pressure. Little by little, together with Van der Poel he put some distance into the other riders, who were not handling the mud of Hoogstraten as well. David van der Poel crashed on a corner and had to be stretchered off the course. Gianni Vermeersch and Michael Vanthourenhout also came down. 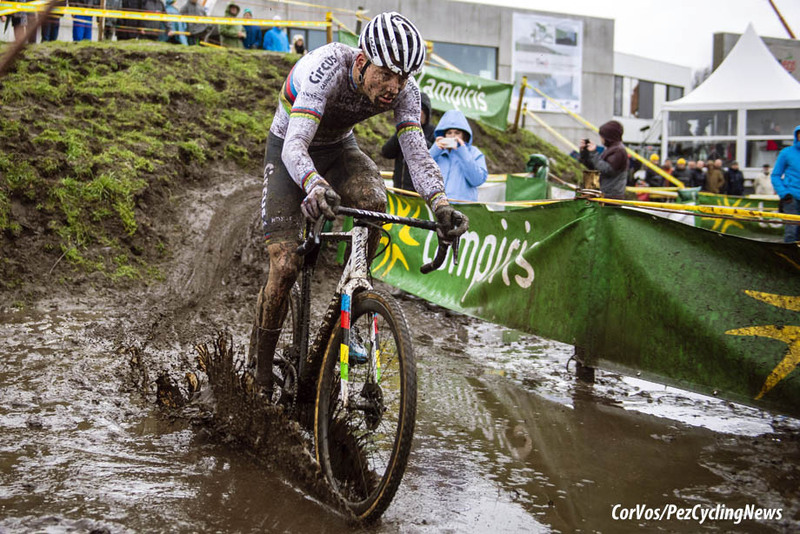 The World champion waited until half-way to drop Aerts from his wheel for the first time. Van der Poel took off on a technical adverse camber and soon had a lead of 6 seconds, but punctured and they were together again. Aerts made sure he took the technical sections first to prevent Van der Poel from attacking again. With 20 minutes to go, Aerts started to look tired and went down several times in quick succession. In a short time, Aerts lost a lot of ground on Van der Poel, who grabbed his 30th victory of the season. Behind; Van Kessel showed himself to be the best of a group of three for 3rd place. Race winner, Mathieu Van Der Poel (Corendon-Circus): "It was not very hot today. I got what I asked for. It is still pretty muddy, it was a very treacherous course. There were many ruts that you could not see. When I started my first attack, I had a flat front tire. Then I raced quite a long time with that flat tire, so I needed a second, third and fourth attempt. I am happy to win here today. I suddenly saw a bicycle from our team, but I do not know what happened. I just saw my brother and he could still walk. So it will be okay. I will definitely ride a full cross program for a few seasons. Until the Games I will combine the cross with the road and mountain biking. Then, perhaps, a discipline will fall away." 10. Jens Adams (Bel) Pauwels Sauzen-Vastgoedservice at 2:24. Philippe Gilbert and Yves Lampaert will get their season underway in France. A flat individual time trial around Saintes-Maries-de-la-Mer – a small town where Vincent Van Gogh produced several paintings in 1888 – and three hilly stages comprising twelve classified climbs will shape up the general classification at the fourth edition of the Tour de la Provence, where our team returns after having previously raced the inaugural edition, where we won a brace of stages and two distinctive jerseys. 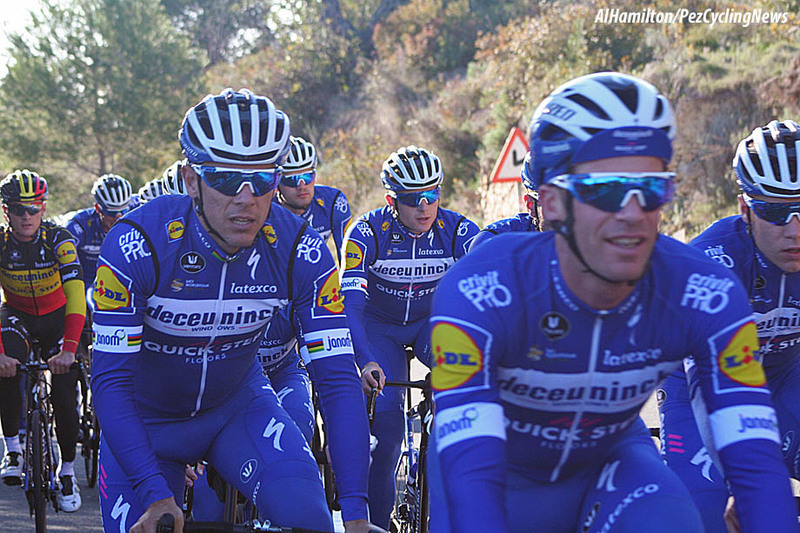 Winner of more than 70 pro races throughout his astonishing career, Philippe Gilbert will headline the Deceuninck – Quick-Step seven-man squad at next week’s race (14-17 February), where he will be joined by World TTT Champion Kasper Asgreen, Rémi Cavagna, Tim Declercq, Belgian Champion Yves Lampaert, Florian Sénéchal and Pieter Serry, all except Cavagna making their season debut in France. “After a nice training camp in Algarve, all the riders are sharp and ready to start in La Provence, a well-organized race which schedules on the opening day an ITT that suits several of our riders. Powerhouse Tim Declercq will keep the break under control the following day and hopefully we’ll be in the mix for the stage victory, in case it will come down to a bunch sprint”, said Brian Holm. Kasper Asgreen (DEN), Rémi Cavagna (FRA), Tim Declercq (BEL), Philippe Gilbert (BEL), Yves Lampaert (BEL), Florian Sénéchal (FRA), Pieter Serry (BEL). Sports Director: Brian Holm (DEN), Wilfried Peeters (BEL). Team Sunweb deliver another young, German talent to the WorldTour as Florian Stork makes the step up from their Development to Men’s program after a successful winter training block. 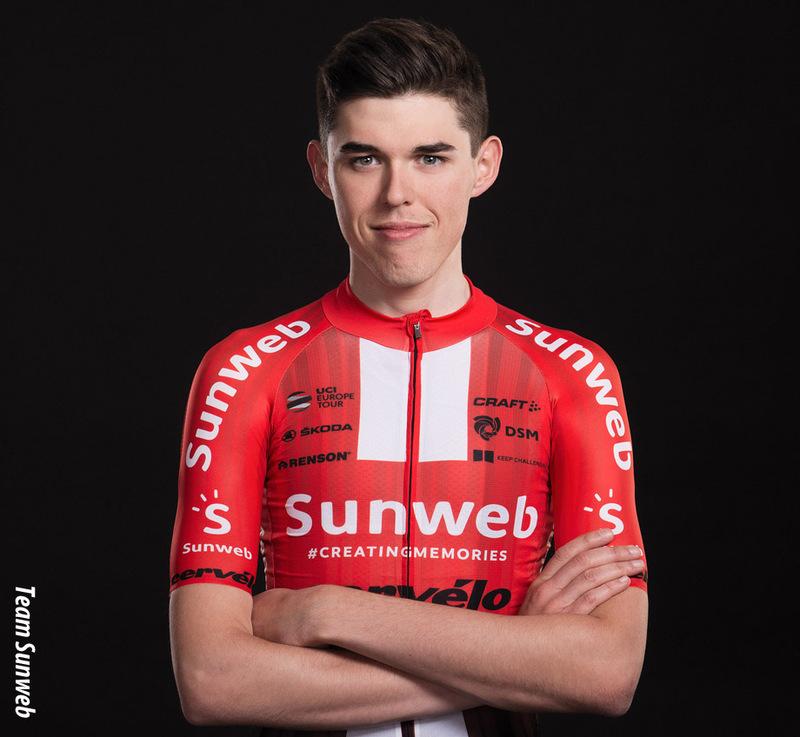 Joining the team in 2017, 21-year-old Stork has played a crucial support role to Development Team Sunweb’s numerous successes, including a solid 5th in the GC himself at Tour Alsace last year. After demonstrating significant progression, the team are more than confident that the move to the WorldTour is the next logical step in his career. Alongside U23 German road race champion Max Kanter, 2017 U23 world cyclo-cross champion Joris Nieuwenhuis and U23 world champion Marc Hirschi, Stork will be the fourth rider to make the step up to the WorldTour from Development Team Sunweb. Stork makes his racing debut at Coppi Bartali at the end of March. This year's edition of the Deutschland Tour (August 29 – September 1) will be visiting the German state of Thuringia on its final weekend. The grand finale of the stage race will be hosted in Erfurt – the state’s capital and largest city of Thuringia. Thuringia is a stronghold of German cycling as the careers of many top riders, like Marcel Kittel or John Degenkolb, started there. The Deutschland Tour will come to Thuringia on its third stage (August 31st). The stage’s final and the entire fourth stage (September 1st) will offer a touristic as well as sporty appealing loop through Thuringia. The overall winner of the Deutschland Tour 2019 will be crowned in the state’s capital in Erfurt. Claude Rach, Managing Director of the Gesellschaft zur Förderung des Radsports, the German subsidiary of the race organizer A.S.O. : "With Thuringia, the Deutschland Tour 2019 will be visiting a cycling-enthusiastic region. Thuringia is not only a sports region, but also a hotspot of modern German cycling. The careers of many German top riders have their origin in Thuringia – reason enough to celebrate the grand finale of the Deutschland Tour there "
Wolfgang Tiefensee, Minister of Economy, Science and Digital Society of the Free State of Thuringia: "The Deutschland Tour is ideally suited to advertise prominently for Thuringia. The route across Thuringia, in which the touristic highlights of the country are shown in the TV coverage, promotes the country and thus appeals to different target groups such as tourists or potential qualified employees who are attracted to Thuringia." Many activities will accompany the pro race of the Deutschland Tour and offer visitors a full-day experience around the bike. Erfurt will also welcome more than 3,000 amateur cyclists to the Jedermann Tour on September 1st – the sportive event during the Deutschland Tour. On top, the Expo Tour will be hosted – a large bike fair with an interesting stage program and attractions to participate in. The kinder + Sport mini tour offers for the little ones, among other things, a bike experience world and balance bike-races. During the Ride Tour, car-free roads for relaxed cycling free of any traffic. Tour of Oman 2019: Number 10! There is an ambiance of a return to business in Oman, despite the summer temperatures that will welcome the riders between 16th and 21st February. At this stage of the season, nobody has yet attached their first race numbers nor worn their new jersey in a competitive context for those who have changed team. Be that as it may, the reflexes are still a bit rusty but the winter preparation is well and truly over. It is time to get to the heart of the matter, namely direct confrontation between rivals who will be battling to be the best throughout the year. On the Tour of Oman, the struggle will see all types of riders involved, whether they are more inclined to shining on the spring classics, specialists of stage wins on grand tours or pretenders for general classification triumphs on week-long races, or longer. The Tour of Oman, appreciated for its alternation between flat and hilly finishes, will put the cream of the sprinting clan in the spotlight from the first stage on the Suhar Corniche and without a doubt at the end of the race on the Matrah Corniche. These seaside finishes should give rise to tough clashes between Nacer Bouhanni, André Greipel, Bryan Coquard and Sonny Colbrelli. However, the riders will have to display a different type of power on the undulating routes leading to Al Bustan (stage 2) and Qurayyat (stage 3). Alexander Kristoff, who boasts the most stage wins in Oman with 8 victories in 9 participations, will be one of the men to watch, as will Greg van Avermaet, who will be looking to improve his roll of honor in preparation for his campaign in Flanders. Nonetheless, the two favorites could be left in the wake of Gasparotto, Magnus Cort-Nielsen or, should the race take a slightly different turn, Niki Terpstra, Oliver Naesen or Nathan Haas. As is often the case, the “Green Mountain” is likely to be crucial in the battle for the title, the day before the race comes to its conclusion. The 5.7-km climb will be the steepest of the week (with an average gradient of 10.5%) and could be used as a springboard to triumph by a climber such as Domenico Pozzovivo, Mathias Frank or Jesus Herrada. However, the winning ticket might also go to the title holder Alexey Lutsenko if, like in last year’s success, he contents himself with keeping with the pace on this climber’s test. Ø The Sultanate of Oman will be welcoming the elite of world cycling for the 10th edition of the Tour of Oman, a favorite race for the perennial spring classics specialists. Among them, sprinters such as Nasser Bouhanni, André Greipel and Bryan Coquard will try to distinguish themselves, but also to do battle on more demanding finishes with Alexander Kristoff and Greg van Avermaet. Ø Traditionally, the climb up Jabal Al Akhdhar (the “Green Mountain”) proves to be decisive in the fight for the title. It should be an ideal playing ground for climbers like Domenico Pozzovivo or Mathias Frank. The 2019 season has started with a series of key new developments for the future of the Union Européenne de Cyclisme, in particular in its management that will undergo major changes and be renewed from the next elections (in the Spring of 2021). The UEC Management Board which met in Bogense (Denmark) on 2 February 2019 approved the proposals to amend the Constitution that will be submitted for approval to National Federation delegates at the UEC General Assembly in Rome (Italy) on 10 March 2019. Rocco Cattaneo, President of the Union Européenne de Cyclisme: "Our agenda will be especially busy and exciting over the next few years in terms of organization. A change in direction was necessary in view of the fundamental changes that our sport and society as a whole are undergoing. The meeting in Rome will be historic since for the first time the UEC Congress and the CAC Congress (African Cycling Confederation) will be held in the same venue and 102 National Federations from the two continents will take part. We have already launched a series of new sporting developments such as the harmonization of the number of kilometers at European Championships Time-Trials, the recognition of e-bike activities, the harmonization of prizes for the Men’s and Women’s categories and the creation of the Junior Women Cyclo-Cross European Championships. We share the International Cycling Union’s (UCI) policy for the new disciplines that will strengthen traditional activities even more. We also believe that more women in management positions is vital for the growth and development of our sport and that this will be hugely beneficial." Don’t forget to check the “NEWSWIRE” section, you can find it on the homepage, just above the EuroTrash section. The bits of news that missed the EuroTrash deadline are in there, plus any news as-it-happens will be added there too. Any comments drop me a line, email address: [email protected] or Twitter. And check the PezCyclingNews Twitter and Facebook Page.